Are you looking to take a fun vacation in sunny Florida? Check out Destinations in Florida. They offer the best price on a Walt Disney World Vacation Package– Guaranteed. They can also help you with a Universal Studios Orlando Vacation package or even a Disney Cruise! Plus they offer great FREE perks when you book your vacation with them. 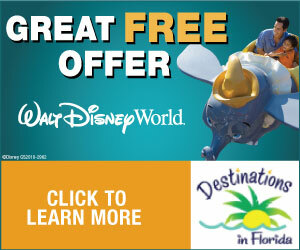 Check out Destinations in Florida now to get a FREE quote on your Florida Dream Vacation! Ask them about FREE dining! The travel agents at Destinations in Florida are different from other travel agencies because most of their agents have worked at Disney Resorts and Disney, Universal Studios, or Sea World theme parks so they are well experiences in Florida vacations. We are a Florida based travel agency with offices in Orlando, FL and Ponte Vedra, FL. We specialize in Disney, Universal Studios and Orlando vacations. Our agents live and work in the #1 family destination in the world. Many of our agents also work at the popular Orlando Theme Parks, so we have the experience and advice you cannot get from any other company. Destinations in Florida Travel is an Authorized Disney Vacation Planner – we are a recognized leader (by Disney) in planning magical vacations to the Walt Disney World® Resort,Disneyland® Resort, and Disney Cruise Line®. Our specialized knowledge of Disney Destinations allows our travel professionals to custom-tailor your Disney vacation and make it truly memorable. We are honored to be selected by Disney to be an Authorized Vacation Planner.